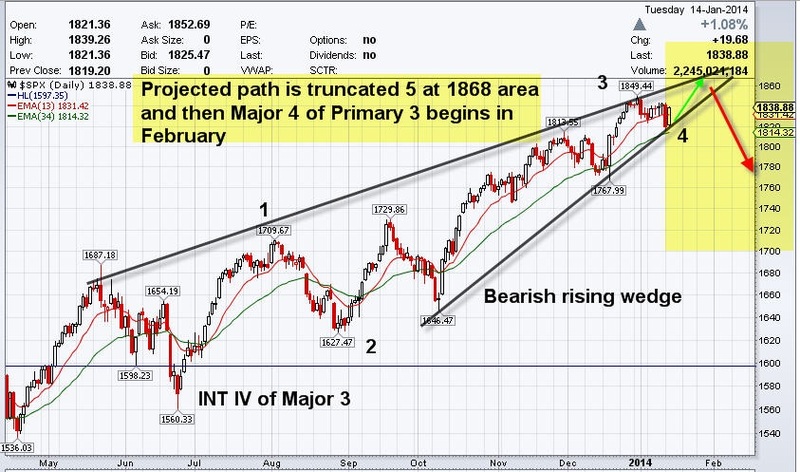 The S&P500 has been in Major wave Elliott Wave 3 up of Primary wave 3 from 1267 by our best projected counts. Our technical analysis of stock trends predicted back in early September a large rally up in the S&P500 to 1822-1829, which we managed to see hit just 3 months later from the mid 1600’s. Our view is that the S&P500 Index or the market should top out around 1868 and then begin a Major Elliott Wave 4 correction in February, and at the same time GOLD and SILVER are forming bottoms now and will begin strong moves up in February. Much like our forecast in early September called for a Top in GOLD and a Bottom in the S&P500 at the time, we see the opposite nearing now. Below is our updated best projection on the S&P500 market trend analysis and near term action, with potential of course for a blow off reversal top over the 1868 area. For now we would watch 1868 and we would be buyers of GOLD as we have been saying for several weeks during this final window into early February. Joins us at www.markettrendforecast.com for regular updates on the S&P500 and Precious Metals.